Cashew trees are flowering evergreen trees that are native to Brazil. 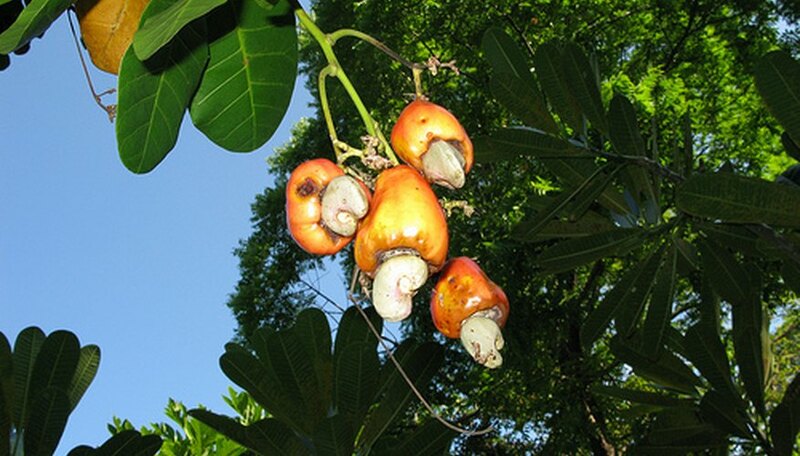 They grow best in tropical areas and are harvested for both cashew nuts and cashew apples. Cashew nuts grow just underneath the cashew apple, which is also edible. Cashew trees can be grown both commercially and in the home garden. Purchase a grafted cashew tree if you would like your tree to bear consistent fruit. If this is not important to you, grow your cashew tree from seed. To grow a cashew tree from seed, soak the cashew seed, or nut, after it has been picked from the cashew tree and dried for three days. Soak the seed for approximately 48 hours and the seed should sprout. Plant the grafted tree or home-germinated sprout into well-prepared soil. The best time to plant a cashew tree is in the spring, but do not plant the tree in an area that has a winter frost or the cashew tree will not last the year. The soil should be a coarse, well-draining soil that contains sand. Rake the land carefully before planting and remove any large rocks or weeds from the planting area. Place the seed sprout-side up into the ground, slightly tilted. Plant seedlings 5 to 10 centimeters deep in the ground. Place the grafted sapling directly in the ground in a deep enough hole to completely cover the entire root bundle with soil. The number measurement will vary depending on the size of the sapling and its root ball. Fertilize the tree with nitrogen fertilizer in two trenches surrounding the tree stump. Fertilize two times a year--once in July and once in October. Apply no fertilizer the first year while the tree is maturing. The second year, add 65 grams of nitrogen fertilizer. The third year, add 170 grams. The fourth year and continuing, add 250 grams of nitrogen. Regular fertilization of the tree will cause it to bear more fruit regularly. Harvest your cashew tree after several years. Cashew trees tend to bear fruit about three to five years after they are planted, provided they have been grafted. Cashew trees that were grown from seed do not always flower regularly. Expect mature fruit that is ready for harvest from April to June. Remove all weeds and dead branches from the growing area of the cashew tree. This will allow the most nutrients to be absorbed from the soil directly into the cashew tree. Prune only dead branches from the cashew tree once a year.